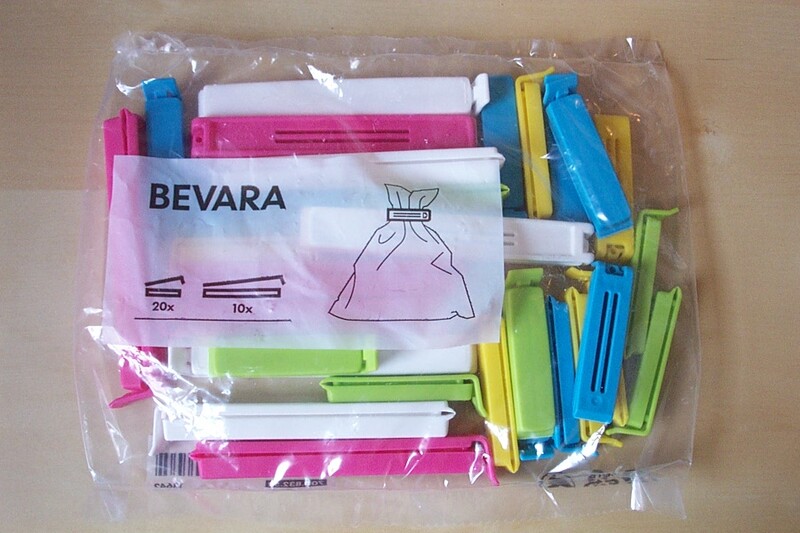 Just what I needed this morning: an injection of weaverly enthusiasm from fellow Bergman loom owner Deborah in the UK! This is her first blog entry since her hip operation in August, and I was blown away to see that she’s already made CLOTH! 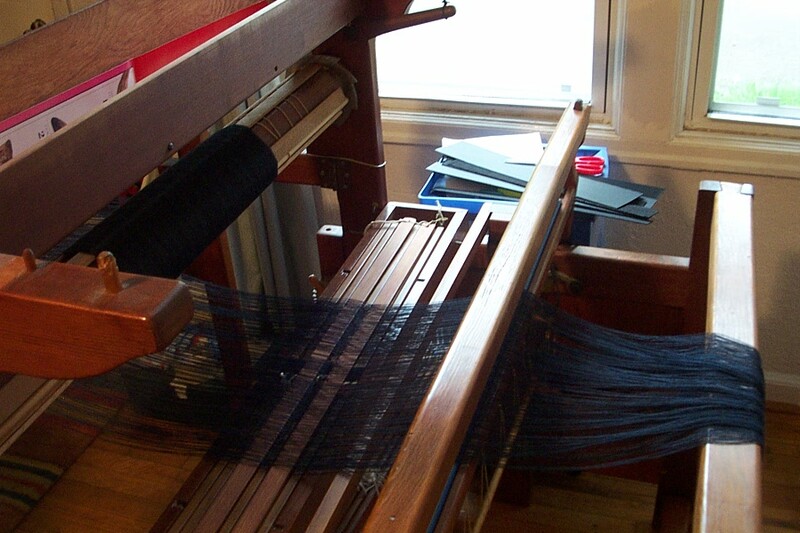 It took me right back to the very first piece of CLOTH I made on my very own loom. Just remembering, I got excited butterflies in my stomach and a peculiar urge to take yarn and dining room chairs outside. 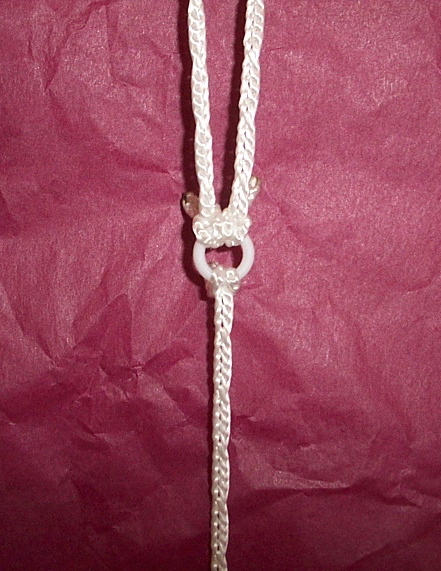 . .
Another UK blog I’ve been enjoying is Weave4Fun, which I found through Jane the Shuttle Pilot. 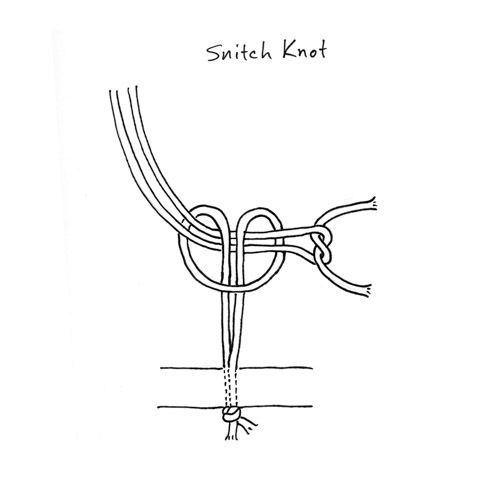 This delightful weaver’s sense of humor and a-typical profile give him a great perspective. His enthusiasm is infectious, too. 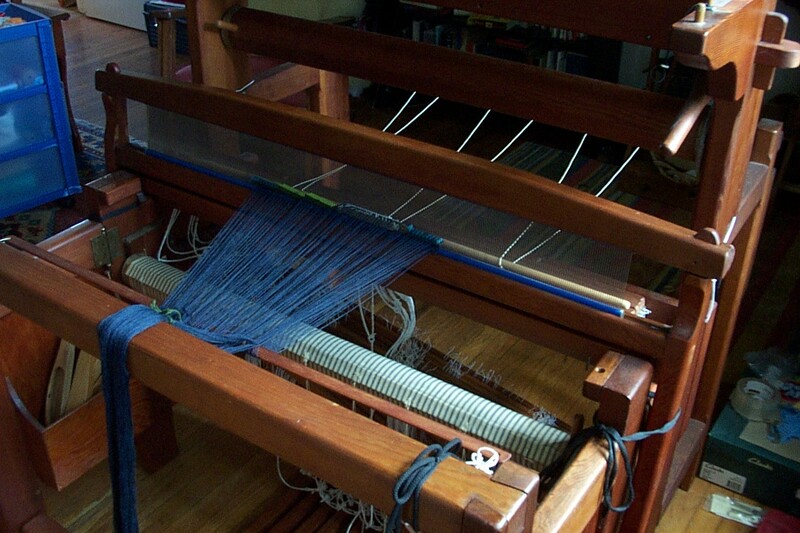 Anyway, both of these blogs, not to mention that of good queen Spinninglizzy, Renaissance woman extraordinaire (who has lovingly spruced up two looms, made a place for her Bergman, and is now preparing to spin her own tie-up cord), has been making me think about where I would be with my weaving right now if I hadn’t started this, you know, thing. With the words. On the internet. It’s solipsistic to write about blogging. 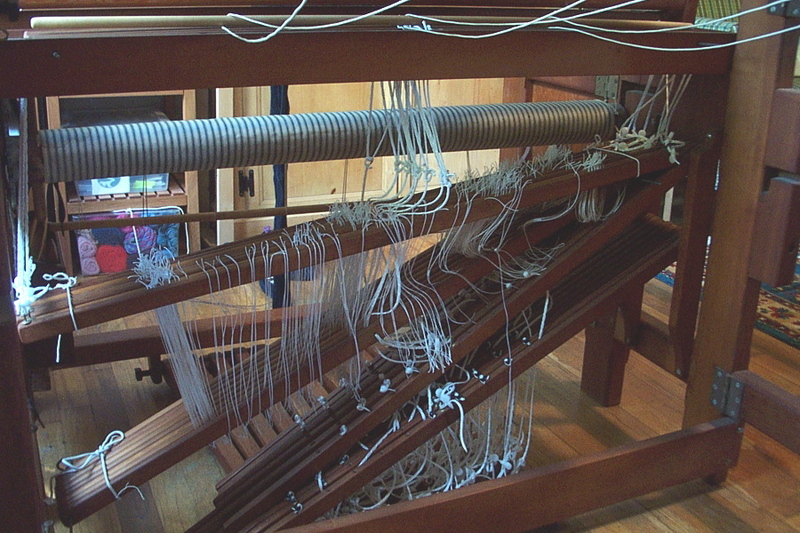 So I’ll put it off and respond to some of the interesting things that have been coming up for Deborah as she weaves her first warp. Interestingly, Deborah’s Bergman is in about the same age bracket as mine and she mentions a lot of the same things I noticed in my first efforts. 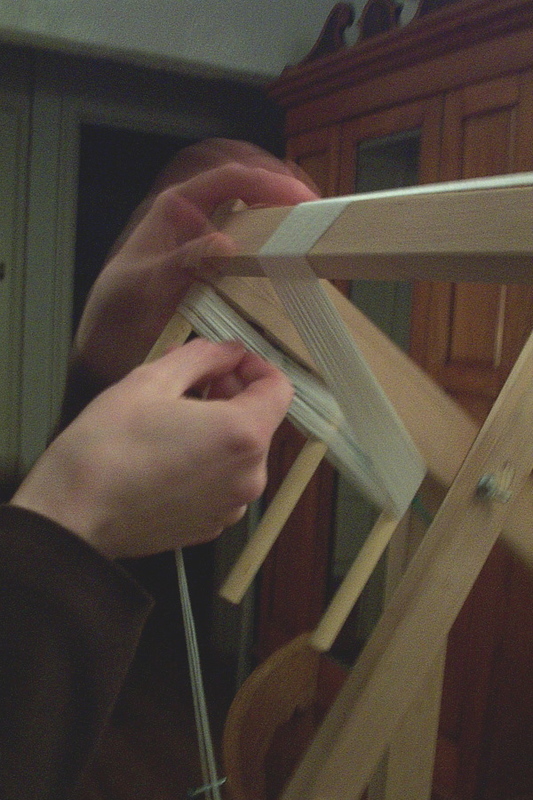 Like Deborah, my loom came with a rusty reed. I started out using only four of the shafts. I had to make a lot of adjustments, and I had trouble figuring out exactly how those adjustments were affecting my sheds. I’d run chasing after one problem, and then another would pop up. And yes: some treadles were just bugaboos! 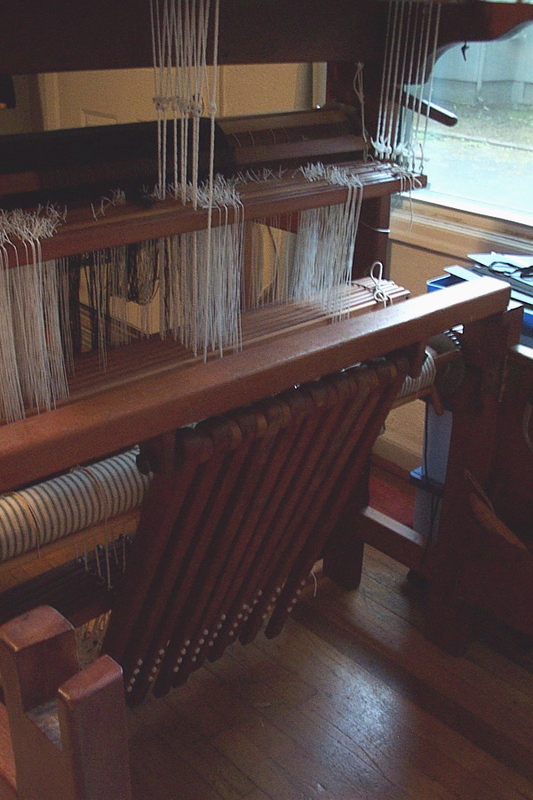 No matter how much I tweaked things, it was as if one particular treadle was laboring under a curse of messy-sheddedness. I now have a little better idea how to improve things, but it’s still a problem. 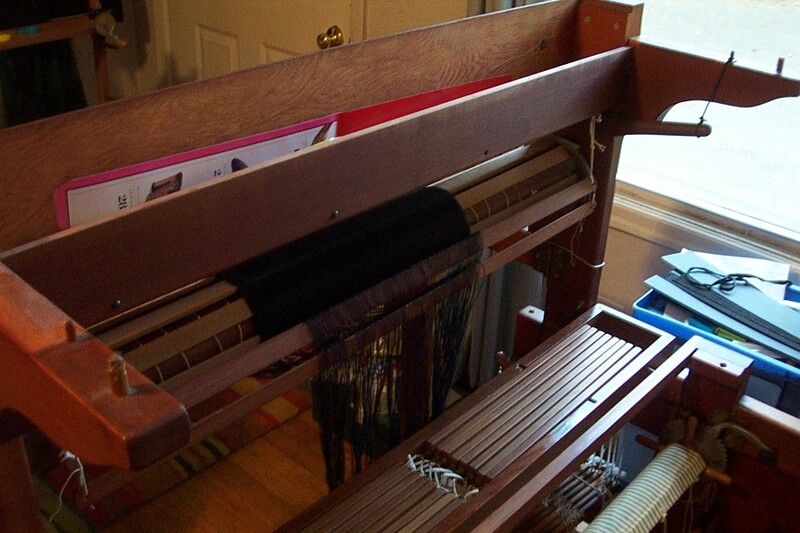 On my recent scarf warp it was the dreaded treadle 9. 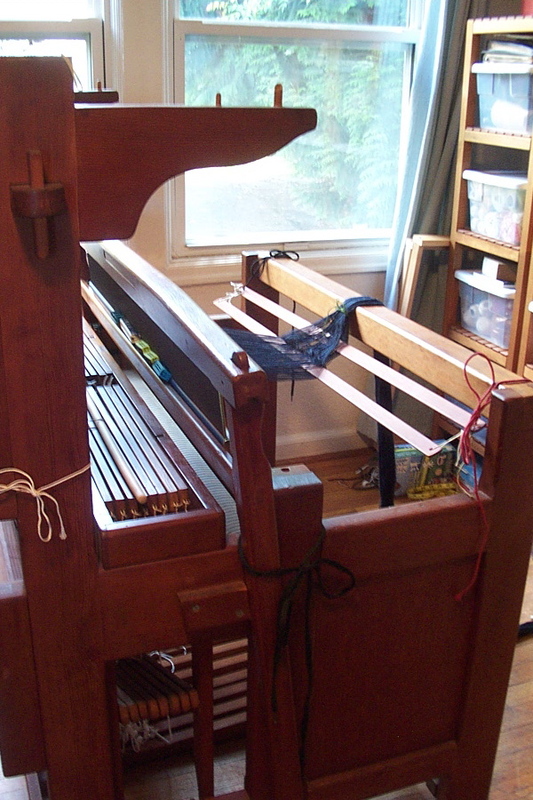 I wonder: does anyone else have an unlucky treadle? 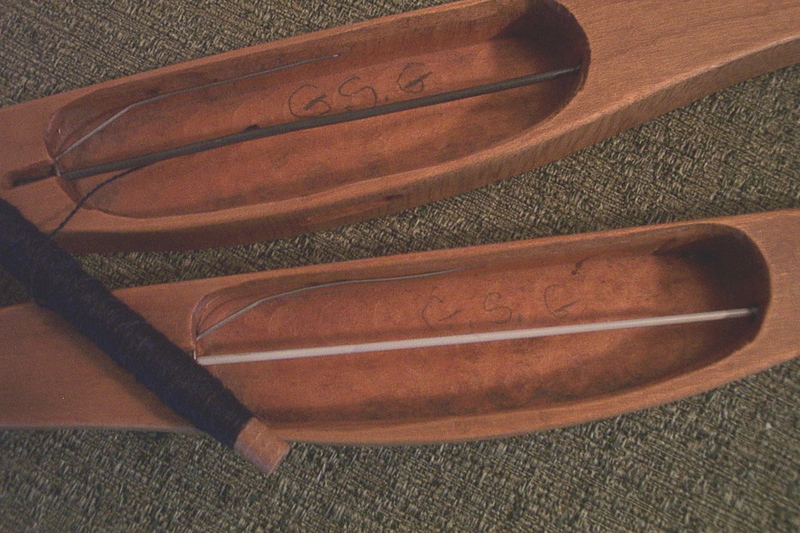 I de-rusted my 15 dent reed by running folded up bits of fine sandpaper through every dent, then polishing off the rust dust with bits of flannel, likewise poked through every dent. I think there might have been some super-fine steel wool involved as well. It took a long time but it was effective. That was before I’d heard about using Naval Jelly (a rust-removing cleaner), which is what I am going to try next time it needs it. Or emery boards. 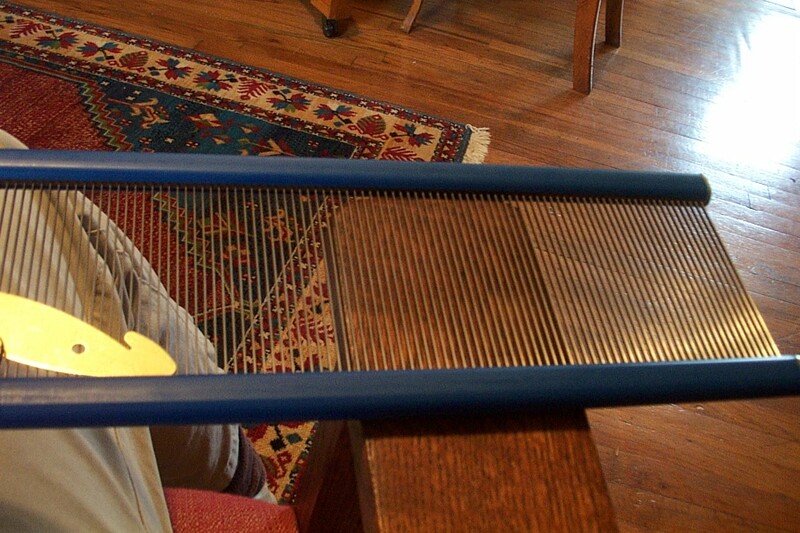 I really liked using emery boards to clean out the slots on my rigid heddle loom. You can buy a big package quite cheaply. Moral: Stainless steel was invented for a reason. 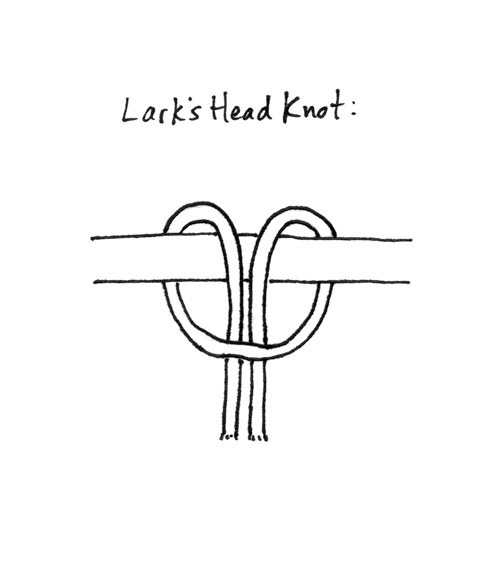 Deborah found Leigh’s excellent information on adjusting countermarche sheds. I came across those entries myself a few months ago. I’ve been meaning to go back to them. You can see from Leigh’s pictures why it is more important to get the bottom threads even. 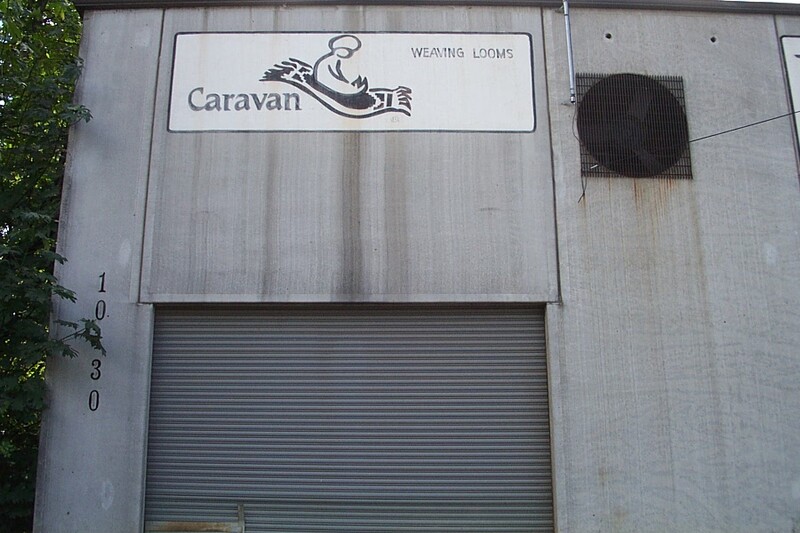 Since your shuttle rests on the bottom threads as you throw it, it’s more likely that it will slide under a sticking-up bottom thread, than that it will catch down a low-hanging top thread. 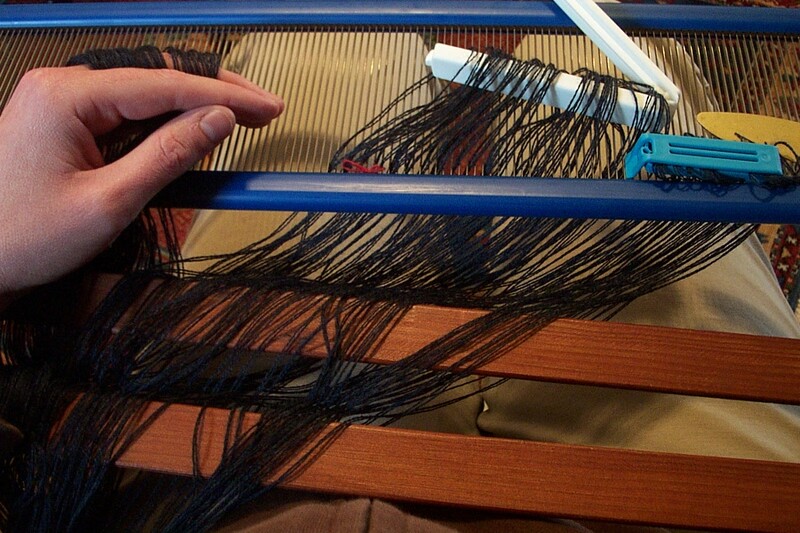 The sensible way Leigh fixes her sheds–making a list of which shafts are causing the sticking-up threads, and tightening the cords that run from the lamms controlling those shafts to the treadles–doesn’t work quite so well with a Bergman, because there is so little margin for adjustment on the smaller loom. I remember seeming to move from over-correction to over-correction. One buttonhole of Texsolv can be (usually is) too much. I talked about this at length in an earlier post. These days I can get my sheds to be tolerable if not perfect. There’s not much more I can add except: make the most of your lamms. Especially on a Bergman where they are truncated. Lamms are levers. You get more leverage (and the capacity to open larger sheds) the farther out your treadles are tied to them: that is to say, if you are using 8 treadles, leave treadles 1 and 2 idle, and tie up treadles 3-10. And when you need fewer than 8 treadles? 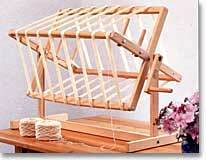 Books will tell you to weave on the exact middle treadles, but I think you can fudge a little. You don’t want to twist to reach your leg across the center line of your body, but it’s actually okay–for example–to work just two treadles with your left foot, and four with your right. 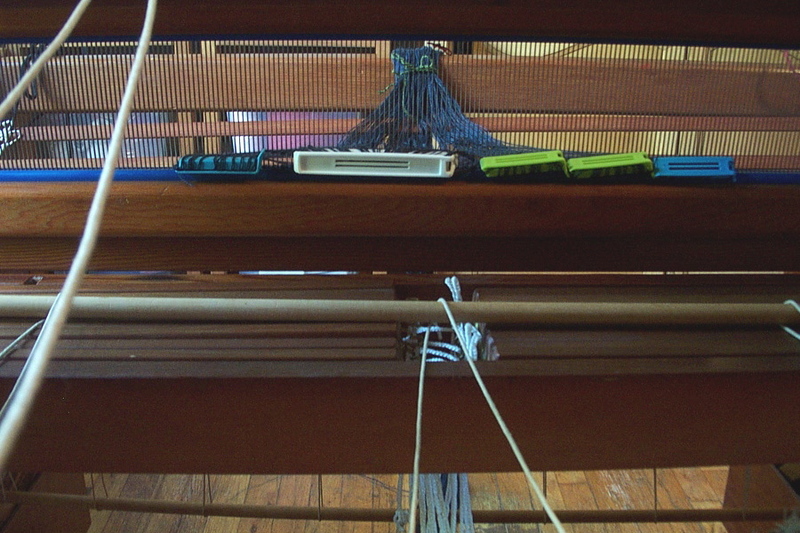 The nice thing is you can rearrange your tie-up according to your treadling plan so that you’re not overworking either leg too heinously. 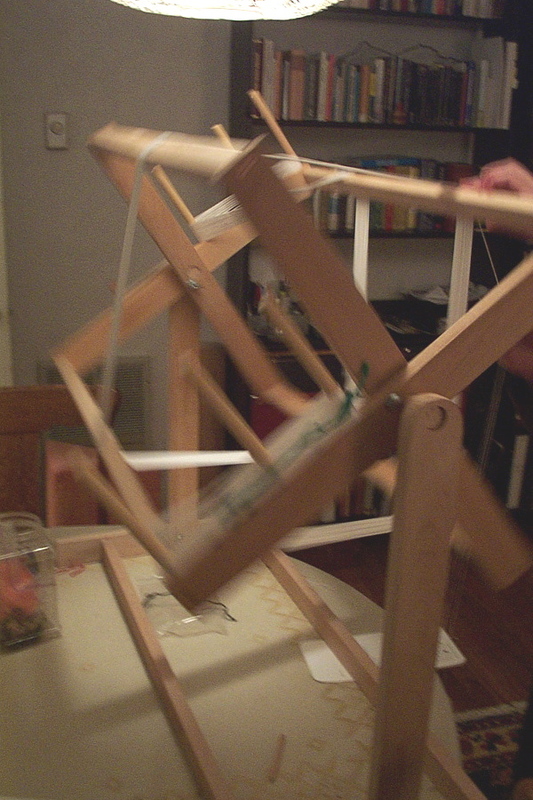 Be aware that the reduced leverage on treadles 1 and 2 can really mess you up if you overuse them. You’ll be tempted to tie them up for tabby (as I did on my recent scarf warp) because with plain weave the smaller sheds produced by treadles 1 and 2 don’t matter so much. I’ll never do that again! My left leg had to work so hard on the tabby that I strained my left SI joint. 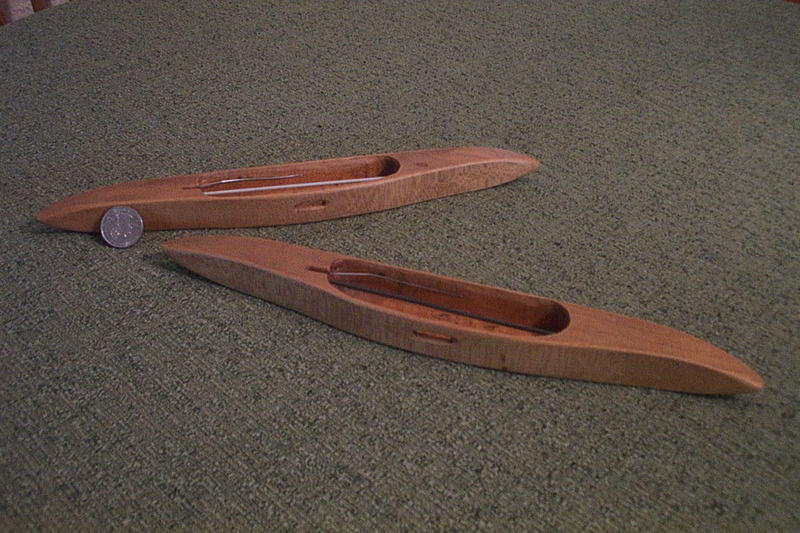 This isn’t to say treadles 9 and 10 are the best, because they are the farthest from the hinge. In my experience, although they make for the least effortful lifting and biggest possible sheds, they’re somewhat more finicky to adjust. 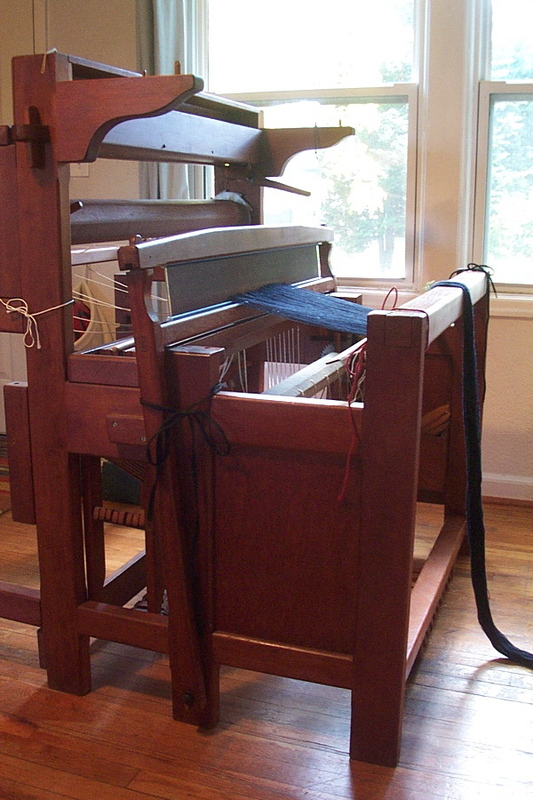 Moral: A treadle on the right is worth two on the left. Now, this will sound bizarre, but another thing that can improve your sheds is to weave on more shafts. I don’t know why; I think it is partially a matter of distribution of weight/effort. 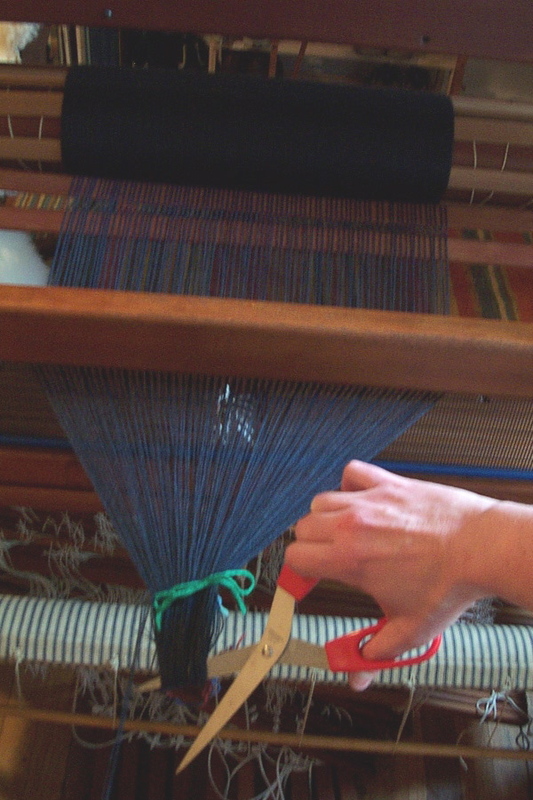 But a lot of the fits I had with sheds and balance when I was weaving on four shafts just melted away when I started weaving on six and upwards. One of those Bergman things? “Where’s that treadle? Why is it so skinny?” I still glance at my feet for the tough ones until really I get in the swing: then I can tell just from looking at the web whether I’ve opened the right shed, which makes me bold enough to trust my muscle memory. Based on when she was born I would guess Mrs Bergman had dainty feet that had been crammed into narrow boots most of her life. 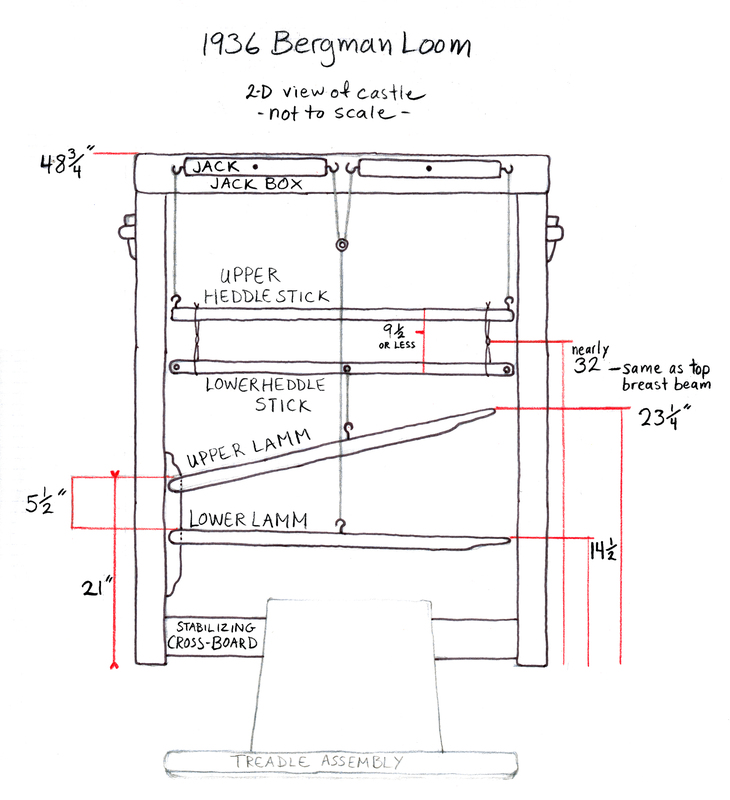 Bergman treadles are narrow and close. I treadle in socks, but I plan on getting some leather ballet slippers to stave off plantar fasciitis. I’ve heard from a couple of weavers who like Acorn house slippers. 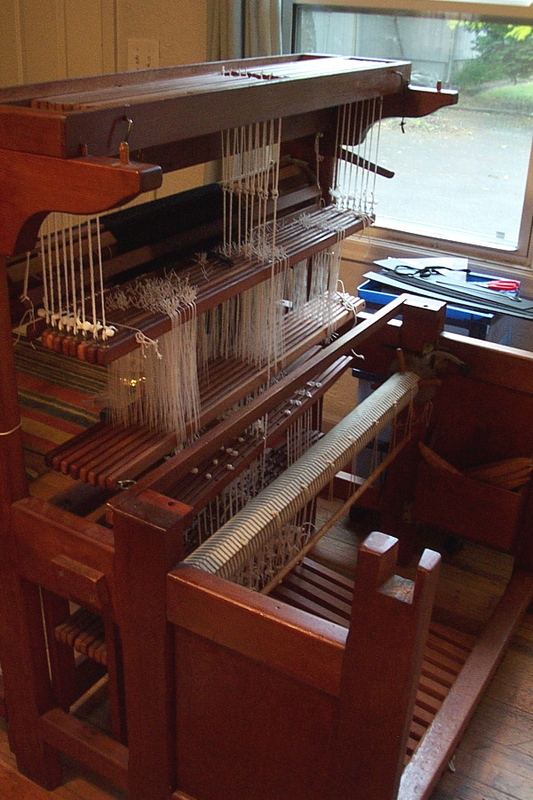 Moral: Do not judge a loom until you have treadled a mile in your moccasins. Deborah has Ann Dixon’s 4-shaft pattern book, which I hear is very good. 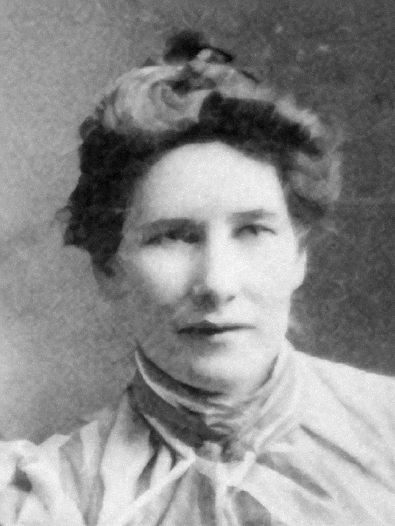 She’d also like to find a good book of eight shaft patterns. Visit her with your recommendations. Mine would be the Praktisk Vävbok. The diagrams are so clear, the Swedish text isn’t really a barrier. I also own Carol Strickler’s A Weaver’s Book of 8-Shaft Patterns. While it’s more diverse (and has some gems) I’m not fond of it; I find the format awkward and unattractive. 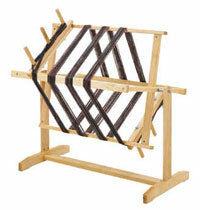 Many of the patterns require more than 10 treadles. 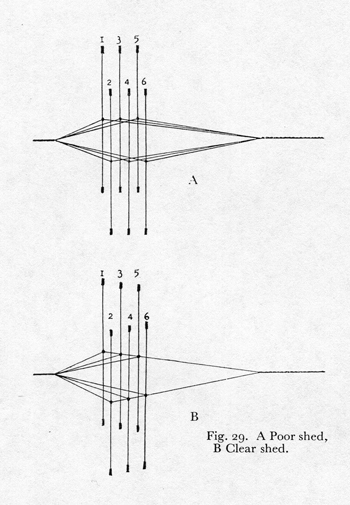 Worse, the texts introducing the weave structures are unnecessarily complicated. I end up understanding less after reading them. Sharon Alderman’s Mastering Weave Structures is fantastic, if you’d like to comprehend what you’re weaving and maybe start designing your own drafts for as many shafts as you wish. Though it’s not intended as a pattern book it has quite a few patterns in it. 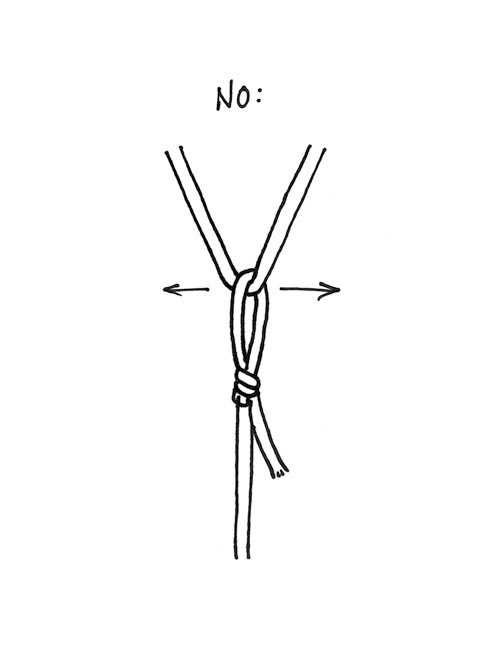 Moral: A good eight-shaft pattern book is hard to find.